I've always felt you could hear if a band was having fun while listening to an album. Somewhere among all the beats and vocals, a sense of pride and enjoyment could be felt pulsing through their music, affecting you as much as it did them. Put that fun on hold and your sound is punished for it, giving the audience a faux version of your music. With Maybe It's Already Everywhere, Mountains For Clouds thankfully focus mostly on the fun of making music. 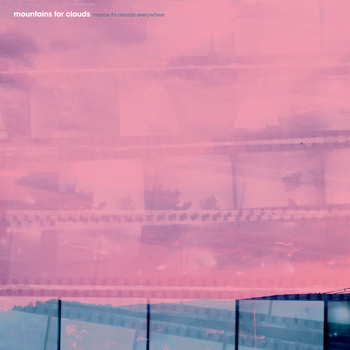 Mountains For Clouds are equal parts experimental, emo and alternative. It's a sound that used to be big when I was in college, where bands like Minus The Bear made a killing playing it. Honestly, there's a slight focus on the emo more then anything else, and that's fine since the vocals never sound like one of your typical, run-of-the-mill pop-punk emo band singers. The singing actually feels sparse throughout the album, which is a small problem I had with the album as a whole. The levels also feel off with the vocals, which can be frustrating if you're one of those people who sing every word of every song at every live show you go to (My voice is actually considered a weapon of mass destruction, so I never sing at shows). Outside of the technical issues, Maybe It's Already Everywhere really builds its strength with its melodies. Songs like "Bear Country (Bring A Rifle)" and "Why I Fight Dragons" (Why are these guys so hostile towards these lovable beasts?) prove to be their strongest additions, simply because they're more melodic in nature and not as free-form as the others. Don't get me wrong, they're both still very experimental, but they definitely have a structure to them, which is essential for bands with this type of approach. "Give Up On Giving Up", "Half Measures" and "Sorry I Didn't Realize I Was Already There" display the most prominent emo themes in the album, sounding more subdued in both style and tone. They showcase the bands ability to stay grounded in their style, while being able to explore different themes. I may never have really given this type of music any real thought outside of bands like Minus The Bear, but this album at least proved to me its something worth giving a second look at it. As the album finished, I came to the conclusion that I didn't have many gripes with it. "I Am Nothing More Than I Ever Could Have Ever Been", which may be the most ridiculously hard title for a song to say I've ever seen, comes across as too emo and too barren a song to warrant inclusion in the album. It lands itself smack dab in the middle of the lineup, and adds almost nothing more then a showcase for the singers vocal talent. Speaking of the vocals, it seems like they're occasionally a bit off, which is fairly common with a genre like this. Most people will completely discount what I have to say about the vocals, and that's fine, because it's more of a personal preference anyways. I'm just very picky when it comes to them..